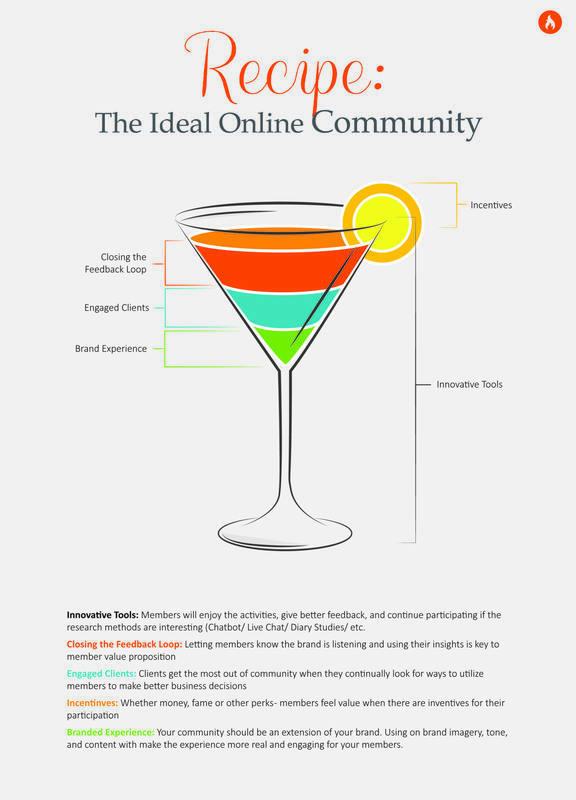 Our team of experts, who have worked day in and day out with clients to optimize insights, gave us their main ingredients for concocting the perfect online community cocktail—our wish is that you can implement these strategies into your own community and reap the rewards. Innovative Tools: Don’t be afraid to get creative with incorporating and adding tools that will help you gain access into the thoughts and habits of your customer. With new technologies constantly being updated, such as heat mapping, chat-bots, live discussions, and diary studies—to name a few—there really is no end to engaging your community members. The proof is in the pudding, our experts say that members who participate in different and fun activities, give better feedback and become inherently invested in future projects. Closing the Feedback Loop: Imagine having the type of relationship where you are constantly giving love and getting nothing in return. Not a very idyllic scenario. So why do this to your customers, who are investing their personal time and energy in providing you with valuable insights. We consistently find that the happiest and most engaged community members live in a space where the feedback loop is being closed. For example, a major beauty retailer was testing a product through their community. Once the product was refined to the point of sale, they made sure to report back to their community members how valuable their insights were in producing the final product. This is one of our strongest and fastest growing communities, and we know that, in part, their success came from simple gestures of gratitude. Engaged Clients: Along with innovative tools, providing members with fun and unique content maintains the health of the community. Not only is this a wonderful engagement tool, but a great way to make better business decisions. The best example we saw of this is when one of our clients—a major media publisher—didn’t currently have any projects they needed to run so to keep members engaged, they decided to ask fun questions to better get to know them. One of the questions was “favorite places to visit,” where they instantly saw enthusiastic replies. Although this activity was meant to be fodder, they quickly realized that they might have an idea on hand and decided to create a piece in one of their magazines based off the conversations they saw. They now consider this one of their most successful pieces of the year, and attribute it to their community members. Incentives: Members will, for obvious reasons, want to join and stay active in a community that promises special perks and rewards. This comes in the form of gift cards, money, fame (recognition)—what have you—a little bit of incentive goes a long way. Brand Experience: We believe that your online community should be a direct extension and expression of your brand. Using brand imagery, reflective in tone and content, will make the experience more real and engaging for you customers. We want you to keep the integrity and look of your brand consistent in your community, so that the space is familiar to the customer. Think, creating a house that your customer has already lived in. We want you to be armed with the best tools to optimizing your online community. Don’t be afraid to play and try new ideas, we’ve only seen our clients directly benefit from being innovative and engaging.